Each year at SIHH, companies reveal their latest and greatest innovations. What three releases over the course of SIHH 2019 stood out to you personally? Overall, this was a strong year for SIHH. At almost every price point and genre there was something that spoke to me, which is a departure from years past. Were there some misses? Most definitely. But for the most part, I found myself impressed with the direction the industry is headed toward. In at least one instance, I’m looking forward to adding an example of the SIHH Class of 2019 to my humble stable. So, with that said, here are the three that stood out to me personally. I first caught a glimpse of the Mojave at IWC’s pre-SIHH preview event back in December in Goodwood, UK. Though it was in prototype form, I was immediately bowled over. I wasn’t the only one, as several other journalists in the room with me audibly gasped when we saw it. To my eyes, this is the Spanish Inquisition of IWC’s 2019 collection - it’s entirely unexpected! (Don’t roll your eyes, you enjoy a Monty Python reference like any fan). While their traditional pilot watch design language remains wholly intact – the bold fonts, clean dial, “propeller” hands and iconic case shape all present and accounted for – they’ve been rendered in an entirely different color. Everything is a variation on tan – or “sand” – which makes sense given the inspiration of the piece, I suppose. Now to details. The size: 44mm is just fine for a watch of this ilk. The engine: Under the cowling lurks IWC’s in-house pawl-driven, column-wheel chronograph movement, the cal. 69380. The chops: It’s resistant to pressure drops, magnetic fields and can withstand a water landing up to 60bar. So, yes, in spite of the odd color scheme, I flat-out love the Top Gun “Mojave Desert”. LOVE. IT. Let’s be clear though, this watch probably shouldn’t be anyone’s first foray into the wild, wild word of IWC Pilot Watches. But given that I already own four, I think I’m ready to kick the tires and light the fires on this one. It’s not often that we see something completely new at SIHH, or, frankly speaking, anywhere in the watch world. For the most part, year in and year out, brands seem determined to scramble to reinvent the wheel in novel ways. So long as it looks good on my wrist and tells the time accurately, who am I to complain? In spite of my complacency, Vacheron Constantin threw caution to the wind and created an entirely new method of presenting a perpetual calendar that makes WAY TOO MUCH SENSE. As we all know, the raison d’etre of a perpetual calendar is its uncanny ability to know exactly how many days are in each month, regardless of that pesky old leap year. This is not an easy thing to do when all you’ve got to work with are gears, levers and springs, hence it’s inclusion in the pantheon of high complications. Of course, there’s a rub, and with the PC it’s that you need to keep it wound. For those with watch winders, this isn’t a huge issue, but that only applies to automatic perpetual calendars. What if yours is of the manual-wind variety? Well, set an alarm, because if you’re lazy in this regard, you’ll wind up (get it?) spending longer than you want just getting your watch up to speed each morning before you strap it on. Sure, you could just set the time and roll with it, but who are we kidding? If you’re reading this, you’re the sort that needs to have everything set just so, and this is where Twin Beat has you covered. Whereas the average manual-wind perpetual calendar from, say, Patek Philippe runs for approximately 60hrs, the movement in the Twin Beat will run for 4 full days. Great, right? Okay, sure. But if you hit the button on the side of the case, the watch instantly trades its 5hz balance wheel for a 1.2hz one, which has the effect of extending the power reserve to 65 freakin’ days. That’s right, you can take the Twin Beat off your wrist and leave it in your drawer – a safe would be preferable but, hey, you do you – for over two months, and when you go and retrieve it, it’ll still show the correct date. True, the time’s gonna be off by a bit – 1.2hz is reaaallly slow after all– but setting your watch a couple of minutes ahead versus setting it two months ahead is a huge difference. Add to the above the fact that the watch is absolutely gorgeous – a true master class in melding tradition and avant garde, in my opinion – and you have a serious candidate for SIHH 2019 ‘Best In Show’. My time with this masterpiece was all too brief. I’m counting the minutes until I can try it on again. ﻿The Swiss watch industry has been tearing its hair out trying to figure out a way to get ahead of the whole Smartwatch Thing, to no avail. Yes, we have the likes of Hublot, TAG, and Montblanc kicking out their own branded versions of the little blighters, but at the end of the day these are merely Android Wear smartwatches in fancy cases, nothing more and nothing less. Sure, they might toss in a few proprietary watch faces, but at the end of the day you’re not getting anything more for your money. Leave it to scrappy Belgian watchmaker and committed iconoclast, Benoit Mintiens, to find a way to bring the old and the new together in way that is at once Something Completely Different yet entirely familiar. The e-Crown made its debut in prototype form at SIHH 2018, but now it’s finally ready for its closeup. At first glance, it seems like any other Ressence with its trademark ROCS (“Ressence Orbital Convex System”) front and center on its rotating dial. Look close however, and you’ll see the automated shutters that open and close to allow the internal photovoltaic cell to power the motor and Bluetooth receiver. There’s also a mode dial that lets the wear know the status of the watch. When connected to an accompanying phone app, the e-Crown uses low-power Bluetooth to automatically sync the time to dedicated time servers, as well as set a second timezone. A simple double-tap on the impossibly domed sapphire crystal “wakes” the watch and instructs it to sync the time. Any single tap afterward will cycle through the modes – time zone 1, time zone 2, app connect, and e-Crown on/off. If the watch is inactive for more than 12 hrs, the e-Crown will stop the movement to preserve the power reserve. Thanks to the aforementioned shutters and solar cells, it never needs to be recharged. And should you decide that you want to be a luddite for a day or two, the Type 2 can operate entirely independently from the e-Crown and go fully mechanical. This is pretty much all I need from a watch. Come hell or high water, I’m gonna find a way to put one on my wrist. Salmon dials were a notable trend this year at SIHH, with highlights ranging from Montblanc’s Heritage Spirit Pulsograph to A. Lange & Söhne’s Datograph Perpetual Tourbillon. But the one I think everyone loved was this lovely AP. Finished in a white gold case with its signature integrated bracelet and octagonal bezel, the 15202BC features a fish-flesh toned mico-tapisserie dial with an applied logo at 6:00. As with any great Royal Oak Jumbo, its hard to tell whether this was made this year or in the 1970s, and that’s why it is truly an icon of design, and absolute standout. Some feel Lange is the most important brand of the modern age. While that sentiment doesn’t properly encapsulate the brand's long history, I’d have to agree that the gauntlet was thrown down by the Germans in the mid 1990s, continually threatening the ‘dominance’ of the Swiss makers in the high-horology realm ever since. The Lange 1, while far from the Glashütte-based workshop’s most complicated model, perhaps most perfectly demonstrates both the design language and craftsmanship for which Lange has come to be revered. This 25th Anniversary Edition pays homage to a quarter-century of Lange 1 production, and features a white gold case, blued steel hands and dial elements, and an engraved hunter case back which lifts to show the movement architecture beneath. Outstanding. When it comes to contemporary independents, most of what you’ll see is truly avant garde in design. While many of these pieces (think DeBethune, MB&F, Armin Strom) are brilliant in design and execution, I’ve often said its harder to do ’simple’ well. Laurent Ferrier excels at this, and his Galet line - in almost every execution - are amongst my favorite contemporary designs. After collaborating with Urwerk to develop a piece unique for Only Watch 2017, Mr. Ferrier felt inspired to step out of his comfort area of round and rounded square cases and developed the Bridge One, a rectangular case design with gently curving lugs reminiscent of pre-war dress watch designs from brands such as Cartier or Gruen. As always, his dial executions remain clean, crisp, and uncluttered. In my opinion, he has succeeded once again in developing a timepiece I would simply refer to as “timeless”. Which releases would you be most likely to add to your personal collection? 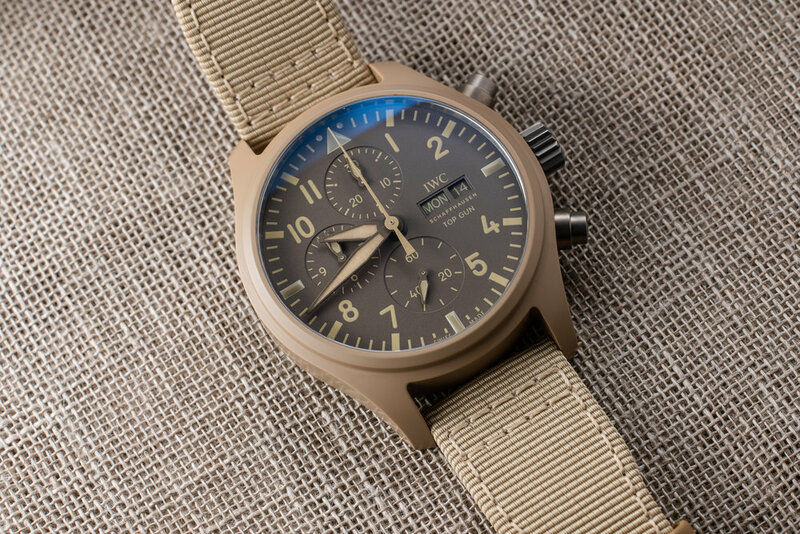 The IWC Top Gun Mojave Desert is the one watch from SIHH that I can say with zero doubt will grace my humble watchbox before long (I’m in for #15). I’m still a bit confused as to why I love it so much, but since when has true love ever made sense? I suppose the real question here is whether or not our relationship will prove to be star-crossed or will it be one for the ages? I’m counting on the latter scenario, but only time will tell. Honorable mentions go to the Ressence Type 2 e-Crown (natch), Montblanc Heritage Monopusher Chronograph (gorgeous and priced right), and the Panerai Marina Militare (I’m a sucker for carbon fiber). Frankly, all of these. I’m fortunate to count in my collection both a Lange and an Audemars Piguet, but have not yet secured a Laurent Ferrier. So to a large degree, my top picks for stand out pieces from SIHH 2019 already mirror my personal interests in collecting. I’ve wanted a Laurent Ferrier as long as I’ve known about the brand. While the Bridge One is a departure from his normal aesthetic, I find it appealing in all regards, and embrace the return of appreciation in rectangular wristwatch design. Last year I scooped up the Cartier Tank Cintrée for just that reason! The Lange 1 I own, the 1815 200th Anniversary FA Lange Boutique edition, is absolutely brilliant. But it lacks the asymmetric dial layout with outsize date and power reserve indication I think best exemplifies the austere yet contemporary design language associated with Lange. A Lange 1, 25th Anniversary Edition or not, is without question worth saving for. As for the Royal Oak, a salmon dial over white metal is ALWAYS a good look, but I won’t be one of the lucky few to put this piece on my wrist permanently. Even if it were a possibility, I would have hesitations of wearing it regularly, as white gold is notoriously soft and prone to scratching and wear. There are few watches MORE incident prone than the RO Jumbo with its sharp edges and integrated bracelet - just look at my once-perfect 5402SA for the proof. Still, if I had the opportunity to scoop one, I’d build a padded room to wear it around in. Were there any releases that affected your thoughts on overall brand identity or involved a creator catching your attention in a new way? To be honest, most of the exhibitors showing at SIHH 2019 merely reinforced my already entrenched perceptions of them, which is neither good nor bad; except for AP that is, which I’ll leave for another day. I will say, however, that Montblanc has really come into its own as a proper watch manufacture and this year’s collection cemented that for me. In particular, the new Heritage collection is absolutely gorgeous and a credit to the efforts of the Managing Director of Montblanc Watch Division, Davide Cerrato. 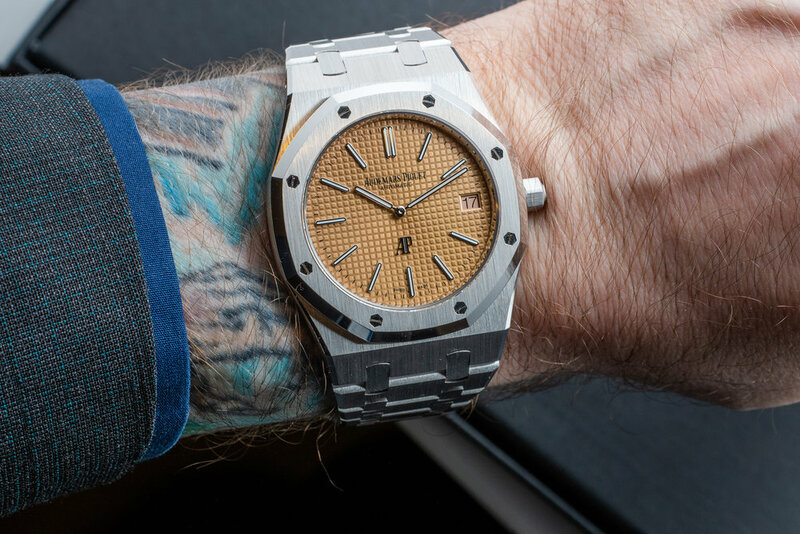 Without question, the topic of conversation among collectors and Journos in Geneva last week never strayed far from the CODE 11:59 by Audemars Piguet. It certainly caught the collective attention of all of us. For the record, this watch isn’t for me - but the attention to detail in the case architecture and crystal construction is superb and worthy of admiration. More than anything, I applaud Audemars Piguet for stepping outside their comfort zone (read: Royal Oak) and experimenting with other designs. Whether the CODE 11:59 proves to be a turd or a home run, its good to see brands with the chops of AP pushing themselves to try new things, making the world of mechanical horology more interesting for all of us.